Traditionally, the two sides of the Ruhr divide have shared a bond of hate, and have consequently played out many entertaining fixtures. These matches are never short of animosity and skill, with the latest offering proving no different. Nachiketh Ramesh analyses the chaos for us. In the first Ruhr derby of this season, Borussia Dortmund emerged victorious while Schalke’s poor run of results continued. Thomas Tuchel started out with a 4-3-3 system. For the visitors, Andre Breitenreiter continued with the 4-4-2 system. Dortmund: 38. Burki; 28. Ginter, 25. Sokratis, 15. Hummels, 29. Schmelzer; 8. Gundogan, 33. Weigl, 23. Kagawa; 27. Castro (Bender, 86′), 17. Aubameyang (Ramos, 90′), 10. Mkhitaryan. Schalke: 1. Fahmann; 3. Caicara, 33. Neustadter (Platte, 88′), 32. Matip, 15. Aogo; 9. Santo, 8. Goretzka, 6. Kolasinac (Hojbjerg, 68′), 7. Meyer (Choupo-Moting, 55′); 19. Sane, 25. Huntelaar. In the beginning, Schalke’s defenders stayed narrow mainly due to the close movements and positioning of Henrikh Mkhitarayan, Pierre Emerick Aubameyang, and Gonzalo Castro – the front line of Dortmund. Due to the zonal system adopted by their coach, during defending, one of the two Schalke’s wingers was playing in the interior channel and tracking the central midfielder close to him (the far side winger). This resulted in the creation of space and a free man (the wingback) for Dortmund in the region close to this winger of Schalke. 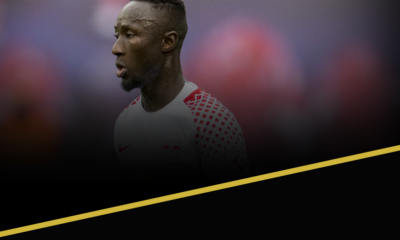 With clever passing and opening of passing lanes, Dortmund players at the back were picking out this player to pose threats from the wide regions. Here, the far side winger, Franco di Santo is tracking Shinji Kagawa. Marcel Schmelzer is unmarked in the far side. Sokratis’ ball to Ilkay Gundogan leads to numerous movements from both the sets of players. 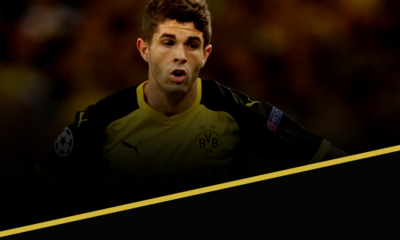 The zonal shift creates more space for Dortmund’s left wingback. Gundogan finds him with a pass after cleverly moving into the space in the middle and pulling Schalke players closer to him. Here’s another instance of the execution of the same idea. In tandem with the defensive line, the midfield line of the away side stays narrow. Horizontal compactness is a feature of a good defensive side. But Schalke leave loads of space between the lines leading to confusion amongst themselves when Kagawa played the ball to Mattias Ginter. 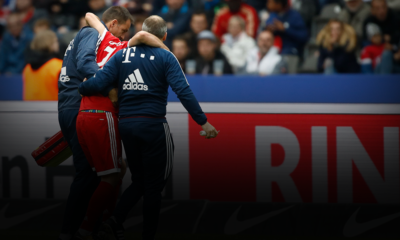 Leon Goretzka and Sead Kolasinac – the central midfielders of Schalke should have remained a bit deep to avoid this. Schalke’s strike force of Klaas Jan Huntelaar and Leroy Sane stayed central when the home side had the possession of the ball, sandwiched Julian Weigl and blocked him from potential passes from the defenders. Matts Hummels and Sokratis had to pass sideways to the wingbacks during the build ups which was allowing Schalke to align to one side of the pitch and shift from one side to the other to counter Dortmund’s attacks. In order to prevent this from happening, Gundogan and Kagawa slotted besides Weigl to offer passing outlets for the central defenders. This allowed them to keep the ball in central zones and the regions around it. Gundogan falling back and augmenting the defence while Hummels (usually) striding forward with the ball was a common sight during Dortmund’s previous games. (Aubameyang’s goal versus Bayern) But since Kagawa was also playing alongside Weigl and was supporting him, Hummels was rarely seen moving forward. 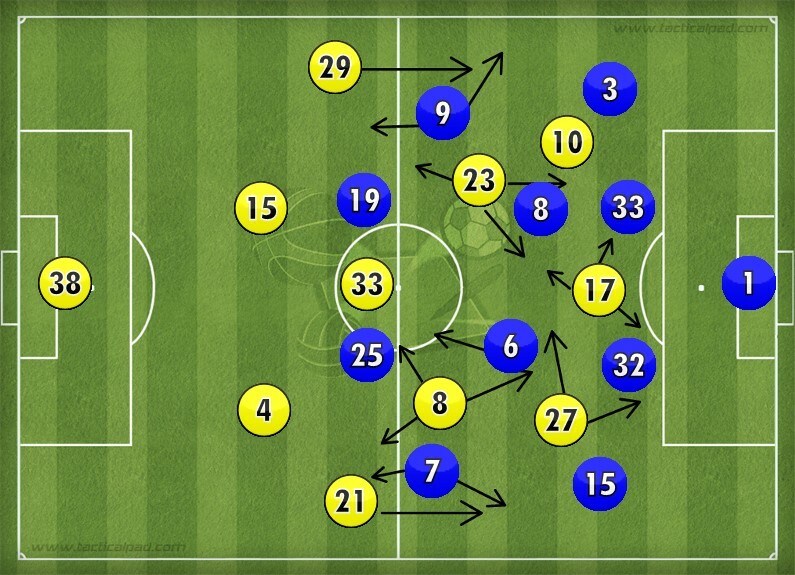 Dortmund’s shape resembled 2-3-5 during the build ups in the early stages of the match. 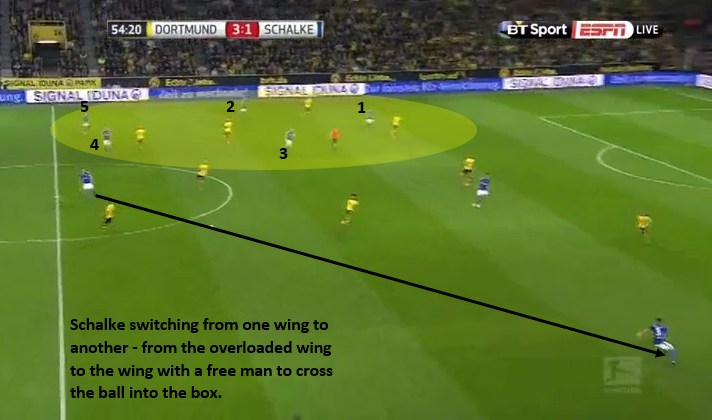 With five players at the back against two of Schalke, Dortmund found it easy to progress the ball. To counter this Schalke’s midfield line started stepping forward which opened up the gap between the lines. The forwards of Dortmund, who were swapping positions, were benefited from this. They made runs into the channels with Kagawa or Gundogan feeding the ball to them. 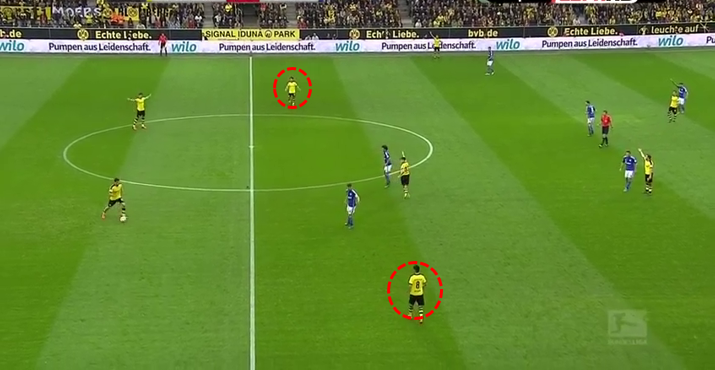 Schalke sorted out the problem of free man by tracking the wingbacks of Dortmund. This forced the wingers of Schalke to stay wide and leave the central midfielders, whom they were marking during the build ups of Dortmund, unmarked. This was one of the reasons for the creation Kagawa – Weigl – Gundogan line in the midfield. Goretzka started tracking Kagawa as di Santo concentrated more on Schmelzer’s runs while Dortmund was playing through the left. Kolasinac was doing the same for Gundogan when the home side was playing through the right. Schalke maintained more central presence while defending and forced Dortmund players to occupy the region around their central structure. This strategy was very effective. Dortmund failed to register even one shot on the target in the first 20 minutes of the game. With only promises and no actual attempts on goal, Kagawa who was staying deep during build ups in the early stages of the match, started to move more into the attacking third. Since Dortmund was losing the intensity of the attacks by moving the ball to the widely positioned players in the final stages of the build ups, the home team needed a player to link the well-built attacks to the forwards. As explained earlier, Schalke held control over the middle zones even though it had very little possession and Dortmund circulated the ball around this controlled zone. Kagawa, by moving into the No.10 position tried to be the link. Do note that he was only moving into this position momentarily. At around the same time, Mkhitarayan too started roaming to connect the passes. The result was, Dortmund opened the scoring a minute later. Schalke attempt, on an average, 18 crosses per game in the league and this is the second highest in Bundesliga. Sticking to their usual style, Schalke attempted in moving the ball to the wings, building the play in the wide regions, and culminating the attacking move with a cross right into the box. Even when Schalke were enjoying possession, they were in some sort of hurry to play the ball to the wings. Schalke overloaded one side and then switched the ball to the other using, most of the times, Joel Matip as the connecting player. This was also evident in Schalke’s cup match against Borussia Monchengladbach. Matip acted as a connector between the two sides. Sometimes, in order to open space in the wings he was running forward with the ball at his feet only to pass the ball to the wingback in the free space created as a result of the run. Schalke mainly relied on counter attacks. The equalizer was a result of pressing by the team in a tight area, quick thinking of the central midfielder Goretzka, and the speed of Sane. Pressing, quick thinking and speed – the three components of a good counter attack was displayed by Schalke. In the wake of the equalizer by the visitors, Dortmund just upped the level of their game. Till then, they had tried to open spaces in the wide areas and build the attacks patiently. There was a change in the gear after the 33rd minute. 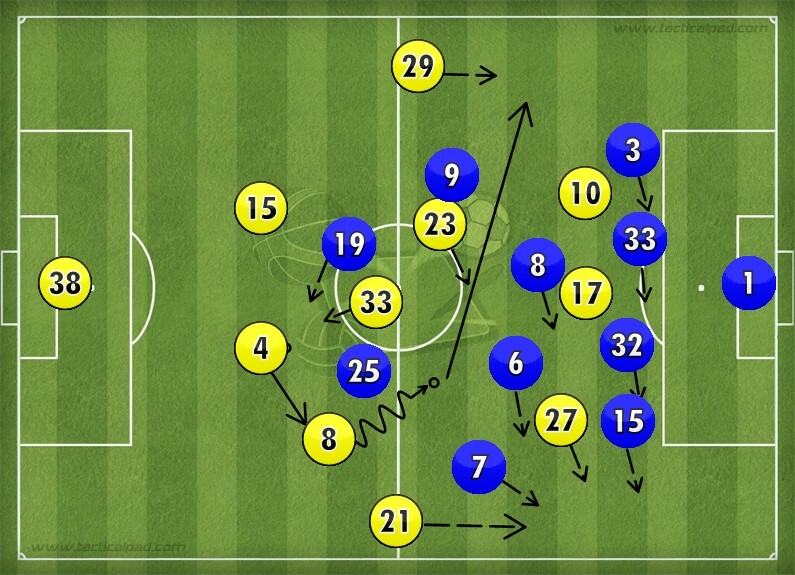 Dortmund started looking for combinational plays in the wings and half-spaces to draw Schalke out of the defensive structure and open spaces in the central areas. In the second half, Kagawa’s horizontal movements began to cease paving way for more vertical movements, leading to more attacks through the left. The shape during build ups in the first twenty minutes was 2-5-3. With Kagawa and Gundogan becoming more active, it changed to 3-4-3. Dortmund turned numerical advantages gained at the back into encouraging attacks. For the third goal, in the final third, they managed to bring up a 3v3 situation and banked on their qualitative superiority over Schalke. 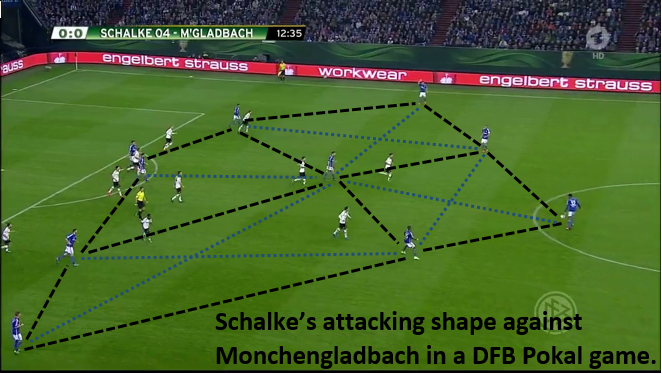 Rhombus (or diamond) was being formed for build ups when Schalke were pressing heavily in the midfield. A rhombus provides three passing option for every player at its tip – two sideways passing options to intensify the attack, a straight passing option to diffuse the pressure piled on by the opposition. Dortmund momentarily changed to diamonds in midfield when Mkhitarayan started to fall back into the space between Schalke’s defensive and midfield lines. Schalke played with only two central midfielders. So when Kagawa – Weigl – Gundogan decided to step up in order to form the diamond with Mkhitarayan, the visitors were facing a 4v2 situation in the middle. This was forcing the wide midfielders (di Santo and Meyer) to narrow down and the wingback on the near side of the ball to step up. 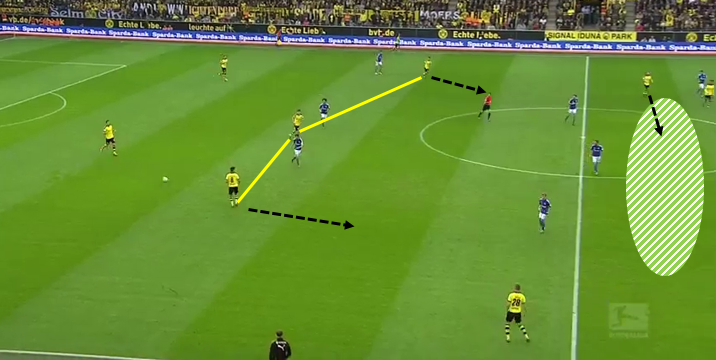 This was leaving three Schalke defenders against two Dortmund forwards and one of the wingbacks of Dortmund was getting space to provide an option for diagonal pass. Here, left back Dennis Aogo has joined the counter pressing team just after Schalke lost the ball. 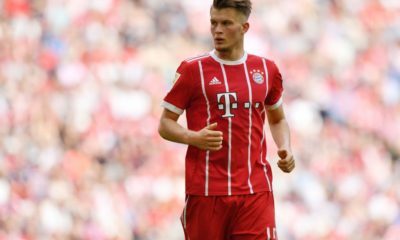 Due to the diamond, Aogo and Goretzka are outnumbered by Gundogan, Weigl, Kagawa and Mkhitarayan. Far side winger Meyer and the near side wingback Caicaro are moving towards the diamond and narrowing the structure. Ginter is free to attack. At the back 2v2 situation is created. Ginter makes a third man run as Kagawa plays the ball to the forwards. As told earlier, Kagawa got inclined more to the vertical axis. Mkhitarayan too started to drop back. This made Dortmund attack through the left half-space, like they have done in the majority of matches this season under Tuchel. 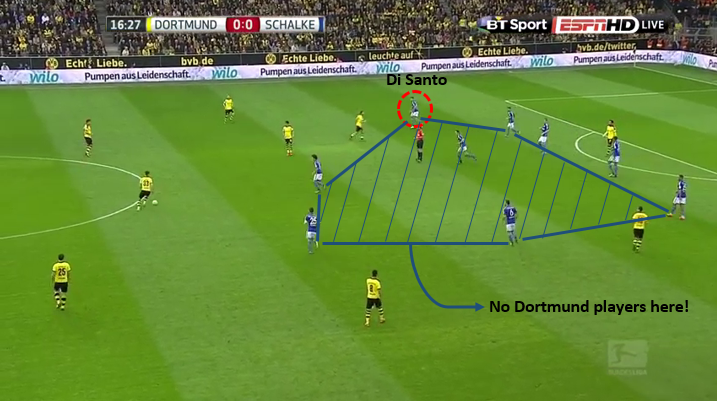 Narrowing the already narrow back line of Schalke and exploiting them was Dortmund’s plan. Staying compact is necessary while defending in order to deny through balls. But when the defensive structure changes to be an over-compact one, then the spaces surrounding it can be targeted by the opposition. When compact structure becomes over-compact and starts shifting zonally just outside the box, then the opposition can find space to shoot with quick and intricate passes. An example of Andres Iniesta forcing Atletico Madrid to be over-compact inside the box and opening space is shown below. The video shows how good an orchestrator Iniesta is and how manipulative deep defending teams can be if they focus one player. 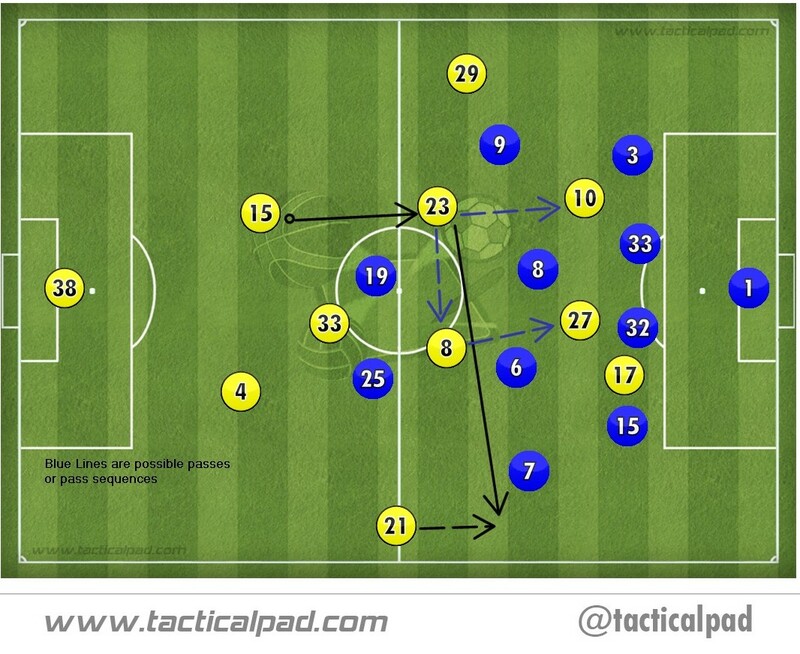 This was a game between a side playing 4-3-3 and 4-4-2 in which all the most of the features of both the formations were at display. The positional play oriented 4-3-3 of Dortmund with changing shapes had the upper hand over more conservative 4-4-2 of Schalke. While Dortmund mixed things up as the match progressed and kept the opponents guessing, Schalke’s plan were more or less singular and concentrated on wing play.